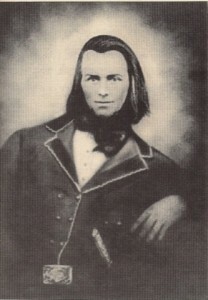 Elihu Beard was 24 when he came to College Hill, then known as Pleasant Hill, to study his senior year at Farmers’ College. He was born into a large Quaker farming family, the ninth of twelve children. The Beards lived in Salem, Indiana, 42 miles from College Hill and their home was an active Underground Railroad station. When Elihu was 19, his father, William Beard and fellow Quaker abolitionist Levi Coffin visited free black and self-emancipated black pioneers in Michigan and Upper Canada to report on the living conditions of the new black settlements. When they returned with renewed energy to undermine slavery, William Beard became the General Agent to raise money for the Union Literary Institute, a school dedicated to educating black and white students near his home in Indiana. As farmers, William Beard and his sons frequently transported agricultural products into Cincinnati and then filled their empty wagon with freedom seekers and conducted them to an arranged stop north of the city. Levi and Catherine Coffin moved to Cincinnati in 1847 and began to connect their well-developed Indiana assistance network to the already established network in Cincinnati. In the 1830s and early 1840s, blacks moving north were directed to Walnut Hills, the home of Lane Seminary, which was located up the steep hill and well connected to conductors and routes north towards Oberlin and Sandusky. William Beard was one of the conductors who transported freedom seekers from Lane Seminary to the next stop north out of the city. Coffin joined the Vigilance Committee in Cincinnati and was a part of an interracial network of black and white abolitionists in Cincinnati who worked together with black and white conductors and operators in the Ohio/Indiana/Michigan/Upper Canada Underground Railroad route to freedom. April 2nd: Arrived at home. Well, I had a fine visit and begin to feel like resting a day or two; but they tell me they have made preparation for me to start to Cincinnati tomorrow. April 3rd: Left home this morning bound for the city. Had very agreeable company and fine weather. April 4th: Reached the city–found old friend Ninde. I had a good time here. Mr. Ninde has just commenced the study of law with Judge Coffin, and Co.
April 5: Spent most of this day running over the city–tending to some business, and ETC. started home this evening. April 6: Arrived at home once more. I had a glorious time on the road today being in the company with some of my old acquaintance, who were as full of jokes2 as ever. I do hereby solemnly and sincerely promise that I will aid the escape of all persons who are making and [sic] effort to escape from oppressive [sic] and making application to me for aid so far as I can without material injury to myself or family that I will give them aid them with food clothing & money as there [sic] necessity may require and that I will if necessary convey them away that I will not give there pursuers any information concerning them and whether any connection contrarie [sic] with the society or so I promise not to reveal the private affairs of the society. Elihu Beard’s diary helps us immerse ourselves in life on the frontier. Elihu spent a busy school year in 1849 in College Hill – a year that brought many new experiences but ended in a tragic cholera outbreak that effected the college and his family. Elihu graduated and in March of 1850 rode his horse to California, returning only twice in his lifetime to Indiana. He built a successful life as a business man in Modesto, California and some public elementary schools in Modesto are named after him. Reading his diary one hundred and fifty years later as a resident of College Hill, I can picture his long walks and feel the rhythm of his life as a student here on the “hill”. I also sense Elihu Beard’s deep love of justice and his belief that slavery was not only morally wrong, but that he could do something about it. 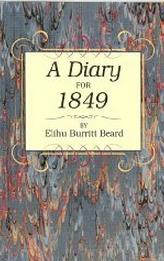 We are very fortunate that we were left the gift of this diary and want to thank Barrett Thomas Beard, a descendant of Elihu Beard, for bringing this book to the public in 1999.